Solve real problems. Learn creativity skills. In this session, you will solve crucial challenges facing your organization by creating hundreds of ideas. You will then select the best of those ideas and develop the next steps to implement them. The challenges are determined by key decision makers and are identified BEFORE the meeting starts. Participants receive targeted creativity skills training and then apply their newly acquired skills to solving the organizational challenges. Design your future so that you move beyond the day-to-day tactics that keep you in the past. The difference between the winners and the “also ran” are the visions and powerful images they create about their future. This is true in athletics and it is even more important in life. Whether you are 16 or 60, having a compelling vision for your future is absolutely vital for success and health. Research on aging has found that those individuals who have a higher sense of purpose live healthier and longer lives. In this session, you will design your future. This session will help you take the long view for your future to move beyond the day-to-day tactics that may keep you in the past. You will leave this session with a vision of your future and specific actions you can take to get you there. In this program participants apply the entire Creative Problem Solving (CPS) process to real challenges that they bring to the program. First, we establish a goal or vision of what you want to create. You then identify all the blocks that are preventing you from accomplishing it and then, in a very short period of time you generate hundreds of ideas to overcome those blocks. You pick the best of those ideas to create a plan that assures your success. 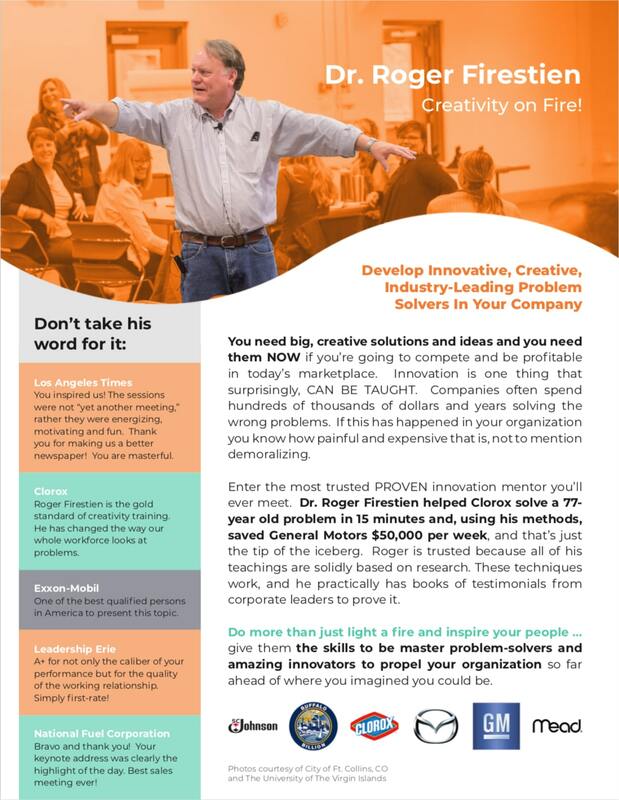 Based on Dr. Firestien’s 40 years of experience in the creativity field, you will apply the most dependable creativity tools that solve 95% of the challenges you might encounter. You won’t be bothered by cute creativity tricks. Learn the Creative Problem Solving Process. Apply it to ANY challenge. Create disruptive and incremental ideas for products or services. The output of a Breakthrough Lab is many incremental and disruptive ideas for new products or new services. After ideas are generated, next-steps are developed to implement those new insights. When these sessions are conducted in the Western New York area, we often add a number of Creative Catalysts to the session. Creative Catalysts are individuals who are highly trained in Creative Problem Solving and successful in their specific fields of business, education, arts or government. Creative Catalysts generate new ideas that lead to breakthrough solutions. We conduct our Breakthrough Labs at The Space Between: The Complex Brain Complex. Create new ideas on demand so that you can Lead on the Creative Edge. Creativity isn’t some mysterious ability that only a few people possess. Creativity is a skill. Just like you learned to ride a bicycle, you can learn how to be creative. You can turn on your creativity at will instead of waiting for ideas to happen. Whether you lead a multimillion dollar corporation, chair a volunteer group, teach in a classroom, pastor a church, or direct a non-profit organization, this highly interactive experience will give you the tools you need to take your innovation and leadership to the creative edge. Train your own CPS Facilitators so that you don’t have to call Roger. Leading Innovation Teams builds on the Two-Day Leading on the Creative Edge program. It is designed to train individuals to be facilitators of the Creative Problem Solving (CPS) process. It is for organizations that want to infuse creativity throughout the entire company. Take all the info home with you! I know that you're probably really busy, and might not have the time to read through this entire website. No big deal, and not to worry! 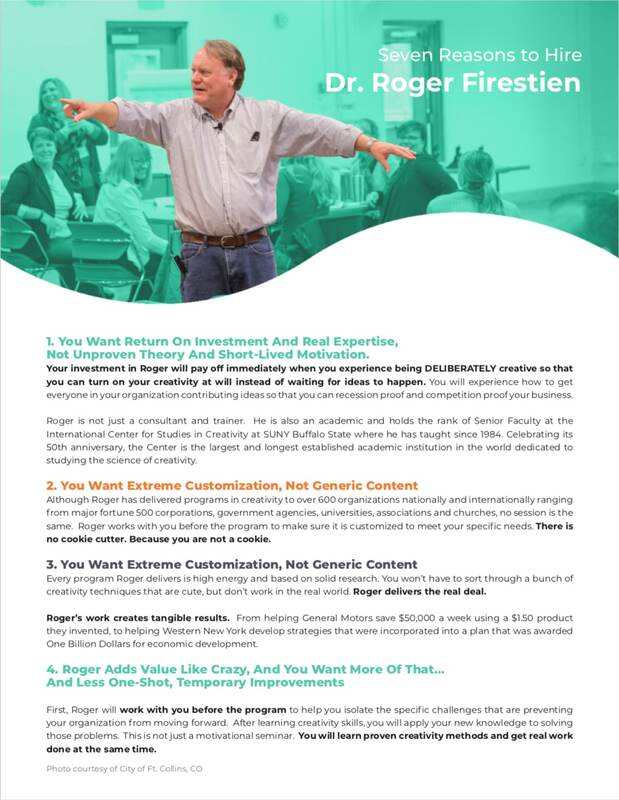 I've created some one-pagers for you to download and read when you have more time. Feel free to print them out and take them with you on the airplane, on car rides with the family, or post them on your wall.